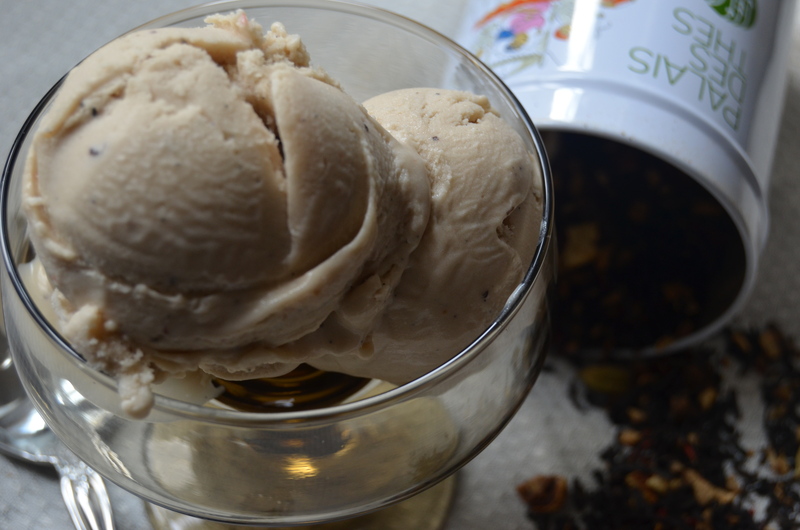 This ice cream is vegan but the texture is creamy and smooth just like traditional ice cream. The amazing chai flavor comes from Palais des Thes Chai Imperial. If you love chai, you have to try this recipe. It’s just like having a frozen chai latte! Add coconut milk to a saucepan reserving about 3 tbs. This amount doesn’t have to be exact, you just need a little to mix in with the cornstarch. Split vanilla bean, scraping the seeds and adding to the pot along with the vanilla pod. Add sugar and chai tea. Next, add cornstarch to a small bowl and add reserved coconut milk. Whisk until smooth and set aside. Turn heat to medium high. Whisk in cornstarch mixture and bring to a boil. Let boil for one minute while whisking then remove from heat. Let tea steep for three minutes. At this time, taste the mixture and test for sweetness level and strength of the tea. Adjust sweetness if necessary and let steep a little longer if you would like a stronger tea flavor. Strain mixture through a fine mesh sieve. Place in a container with plastic wrap covering the surface of the ice cream in case a film forms on top. Let chill overnight or until completely cool. Process according to your ice cream manufacturers instructions. Transfer to a container and freeze until completely set. Scoop and enjoy.